The experimental piece I have been working on today has been really interesting. It has been something I have wanted to have a go at for nearly 2 decades but have never really been brave enough to risk ruining a piece of silver if things went horribly wrong! 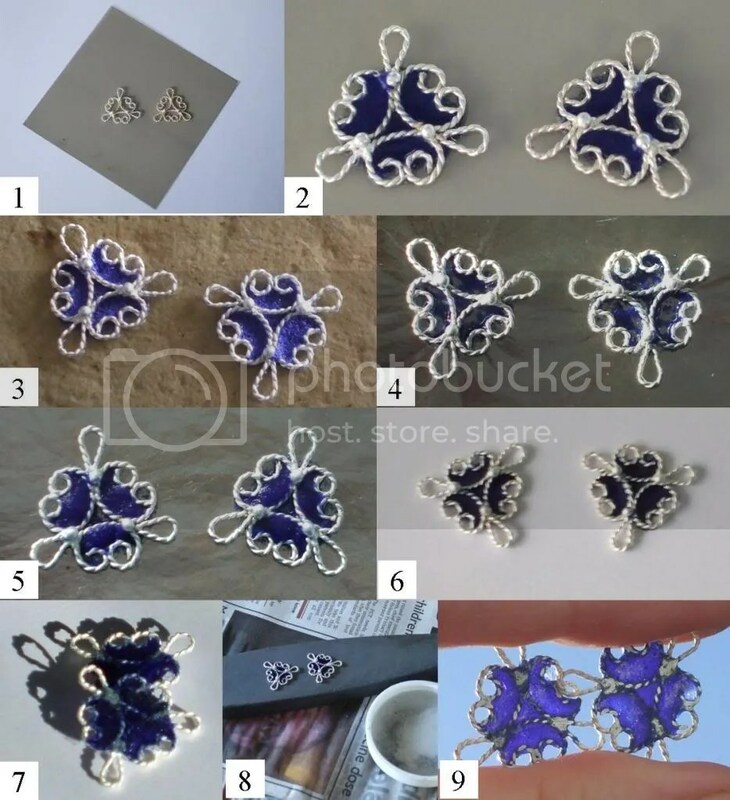 When I had a go at making some filigree silver pieces from fine silver wire earlier in the year, I realised that this would be my opportunity to have a go at this technique of enamelling as the value of the silver in the filigree pieces was not very large and I could just about live with the possibility that the whole lot might be trashed! So this is my journey through the plique-a-jour window! Plique-a-jour enamel is a style of enamelling where transparent enamels are fired into individual cells without any metal backing – thus creating a stained glass window effect. 1. I purchased a piece of mica sheet to use as my ‘non-stick’ backing plate and put my filigree pieces onto it. 2. 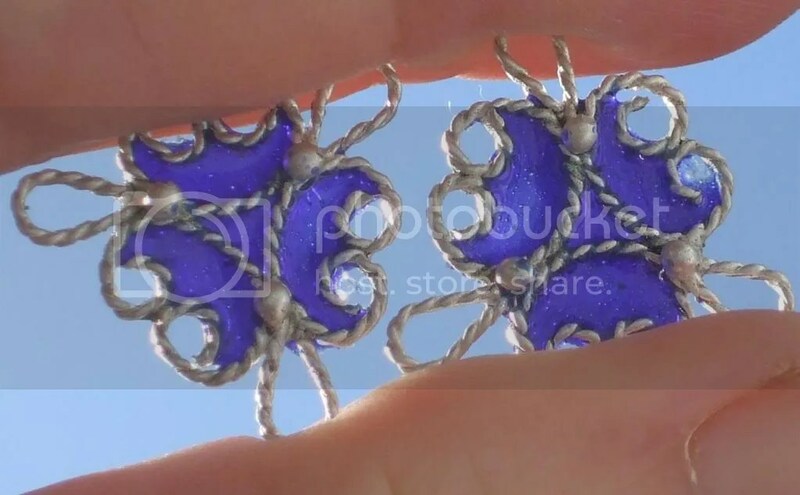 I then attempted to fill each of the little cells with wet enamel – although there was a little bit of bleeding underneath the wires due to the twisted nature of the filigree wire it was impossible to get good contact between the wire and the mica sheet. 3. This was the enamel after it had dried for a while on top of the kiln. 4. …and again after it had been fired for the first time! Quite a few holes to be filled there!! 5. More wet enamel was put on top and then fired again. When everything had cooled down a gentle lift with a fingernail behind the wire and the pieces just pinged off of the mica…brilliant!!! 6. The effect from the front is now fine. 7. …but the look from the back is pretty rough!! 8. I ground down the enamel from the back of the filigree using a carborundum stone. All in all – I think this has been very successful – as I have seen how well the mica backing sheet works and how easy it is to remove the enamelled pieces. I would try again using a lighter coloured enamel as the royal blue is a bit dark unless held up to the light. I also think it would work really well for pierced sheet silver – or PMC. I have always loved Art Nouveau styles and this enamelling technique was used a lot by Rene Lalique…so I will definitely have another go later on!